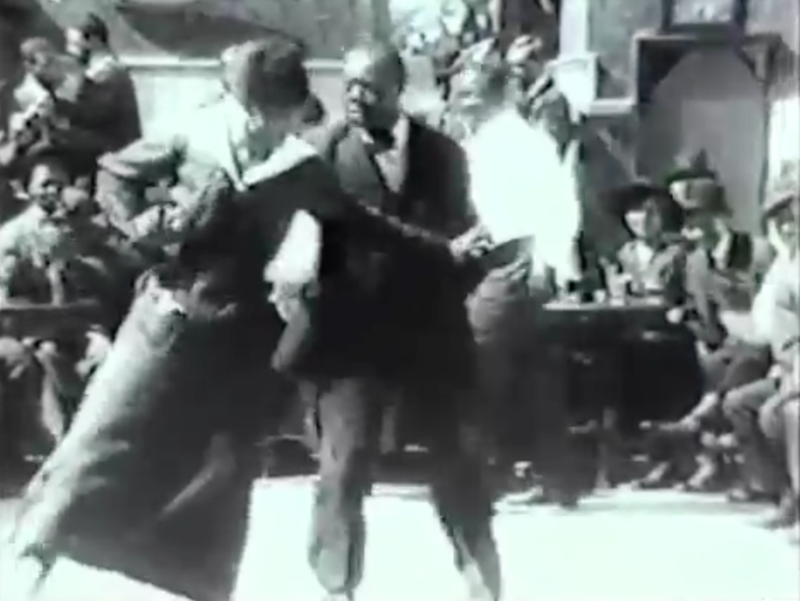 This is the original swing dance, the Texas Tommy, as danced in San Francisco c. 1910. 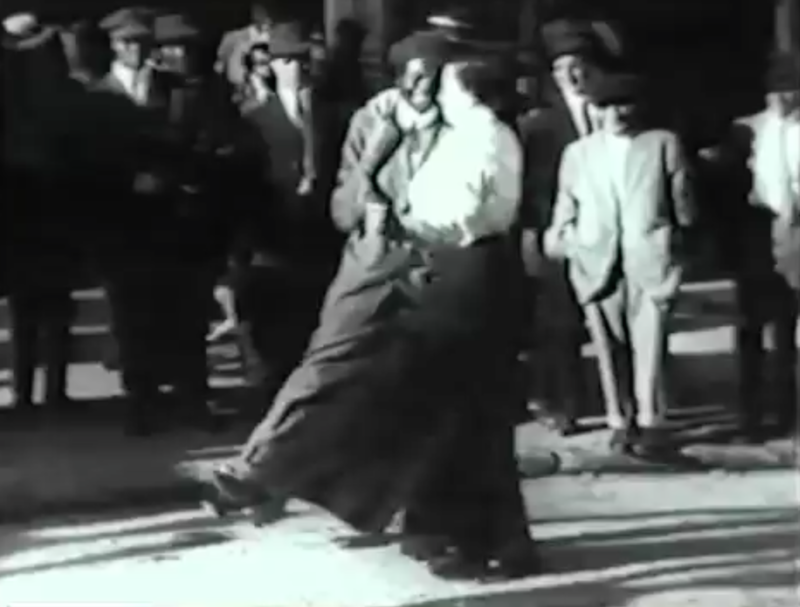 In 1911, two Texas Tommy dancers, Ethel Williams and Johnny Peters, brought the Texas Tommy from San Francisco to Harlem, where it became popular as a vaudeville act and eventually evolved into Early Lindy Hop through social dancing at the Savoy Ballroom. Here are reconstructions of some of the figures. Note: The names are entirely speculative, based on contemporary variations they resemble. There are four basic steps that comprise the footwork of the Texas Tommy. Texas Tommy Basic: The Lead steps side to the left ("1") then scuffs the right heel to the floor to the right side ("2"), as the Follow steps side to the right then scuffs the left heel to the floor to the left side. Repeat opposite. There is a double bounce throughout, like a jackhammer (1-and-2-and, bounce-bounce-bounce-bounce, or hop-hop-hop-hop). Posture is straight up, but relaxed. Texas Tommy Two Step: The Lead drops down on his left foot, flicking the right toe out to the side ("1"), takes weight for a split second on the right foot to the side ("and"), and drops down on his left foot again, flicking the right toe out to the side, as the Follow mirrors him. Repeat opposite. The posture is lower than that of the Texas Tommy Basic. Texas Tommy Pivots: The Lead backs around in front of the Follow, as she steps slightly forward between his feet ("1"). Then the Follow backs around as the Lead steps slightly forward between her feet ("2"). Repeat, turning continuously. These pivots can turn in place, or they can travel around the room. In addition to these four basic steps, there's a fifth basic step, which both couples use at the end of their dances. The first couple dances it in closed position (with mirrored feet), while the second dances it in Skater's Position (on parallel feet). As it appears only briefly at the end of each dance (and the first Follow seems to miss it), it's unclear whether this step should be considered a canonical Texas Tommy step on the same level as the previous four, but it's certainly another interesting example of continuity between the Texas Tommy and the 19th century round dances it evolved from. Texas Tommy Racket: Similar to the 19th century Racket, the Lead steps in place with left ("1"), undercuts the left with the right, stepping in place with the right where the left used to be ("and"), undercuts the right with the left, stepping in place with the left where the right used to be ("2"), etc. The free foot swings slightly to the side, out of the way of the undercutting foot. Finally, as yet another example of continuity, whenever Couple #2 starts to Pivot, they begin with one bar of regular Polka (not the Texas Tommy Two Step, but the turning, traveling, 19th century Polka), starting the Pivots on the second foot. Open Two Hands: Open two hand hold. Right-over-Left: Holding right-in-right hands, with left-in-left under right-in-right. Barrel Hold: Both partners holding each others' shoulders, the Lead's arms under the Follow's. Alternatively, the Lead holding both of her shoulders from beneath while she has one or both hands free. Or either partner can hold the other's biceps. Some form of Barrel Hold is always used for the Pivots. Underarm Turns: With either hand (or right-in-right), the Lead leads the Follow to turn in place under his arm. The footwork is the same as the Basic, falling in place beneath her. Double turns are also possible. Back to Back: The Basic, but back to back, holding both hands out to the side. Get into it from two hands by letting go of one hand and turning halfway away from each other, retaking the other hands when back to back. Barrel Roll: From two hands, both turn away from each other, as in Back to Back, but continue on until face to face again. Keep both hands the whole time, with both partners turning under both arms. Barrel Roll can also be used as an entrance to Back to Back. Shadow Position: From right-over-left hands, the Lead gives the Follow a half turn turn clockwise, to end up in Shadow Position with the Follow at the Lead's left. Sweetheart: From Shadow Position, the Lead passes the Follow in front of him from his left side to his right side, peeking at her over her shoulder, as she peeks back at him. She's at his left side when stepping on her left, his right when stepping on her right. He stays mostly in place behind her. Face Loop Handhold: This is yet another handhold for the Basic, with right-in-right hands wrapped around the left side of his neck, right hands resting near his right shoulder. Left hands can float free, or be held left-in-left between their bodies. You can get into it with a face loop from right-in-right, turning the Follow counterclockwise one full turn, looping her head, then looping his. It can also be used as an exit from Shadow Position, in which case it's only a half turn. Skater's Position: From right-in-right hands, the Lead pulls the Follow to his right side, turning her halfway counterclockwise and taking left hands in front, to end up in Skater's Position at his right side. The right hands are at her right hip, the left hands in front of the Lead. Pivots, Free Spin: During Pivots, the Lead lets the Follow go, and she does one full pivoting turn by herself. Catch in swing out position, and pull back into closed position to continue partnered pivots. Swingout with Hand Change Behind the Back: During Pivots, the Lead places the Follow's right hand in his right hand, low behind her back, then lets her unwind to right-in-right swing out position. She then winds back in again, right hands still behind her back, to recommence pivoting. While in the right-in-right behind the back position, he can hold her right shoulder with his left hand. Alternatively, from right-in-right swing out position he can pull her into Skater's Position, or lead any of the right-in-right variations above. "One of my dance partners, Catrine Ljunggren, who studied extensively with legendary Lindy Hoppers Frankie Manning and Al Minns and who was in fact Frankie's teaching partner for many of his workshops, always chastised me when I referred to these movements as the Texas Tommy. According to Catrine, Frankie always insisted that he "never knew [any] Tommy from Texas" and that dancers of his era named steps exactly what they were. Accordingly, the movement that many modern Lindy Hoppers call the Texas Tommy should actually be called "swingout with hand change behind the back." 1910s ragtime, around 90 bpm. Thanks to Richard Powers, who introduced me to this dance and theses videos.